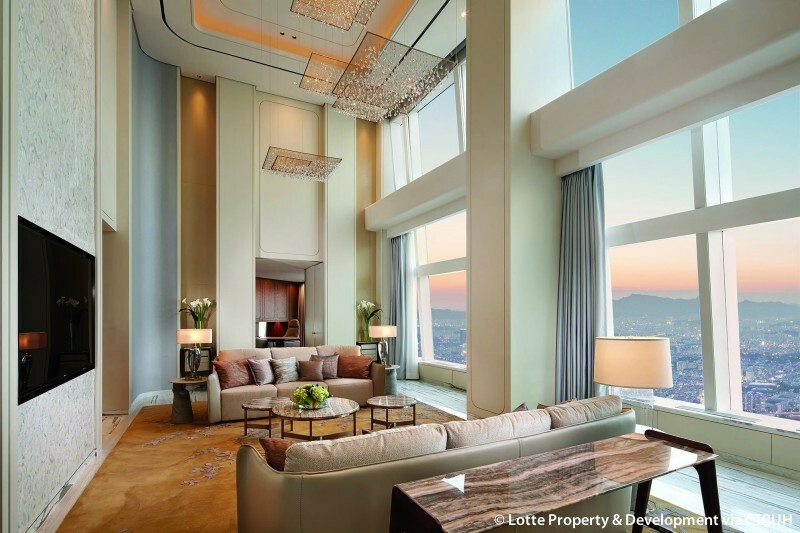 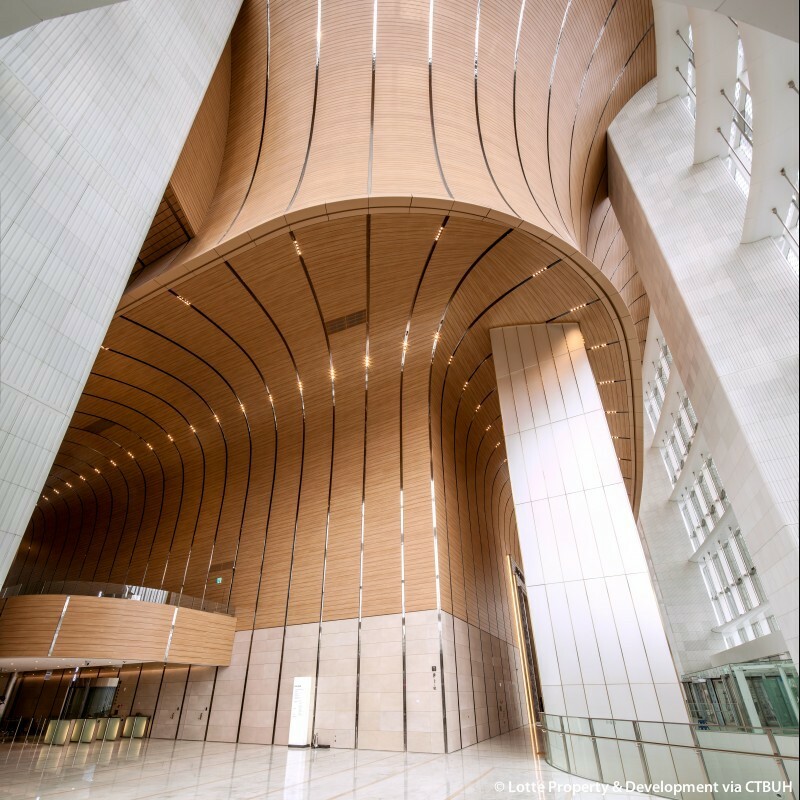 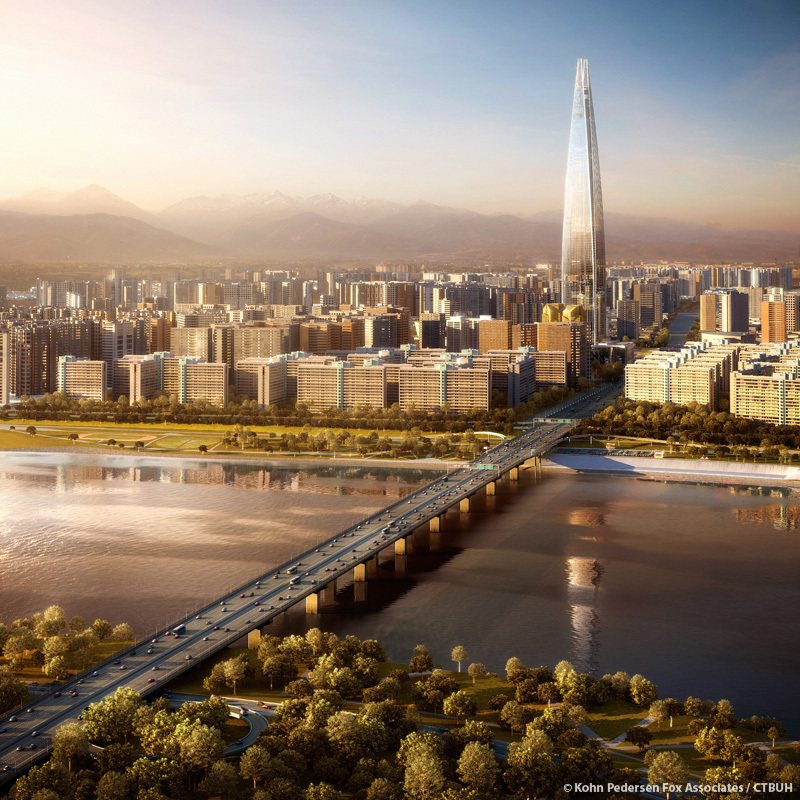 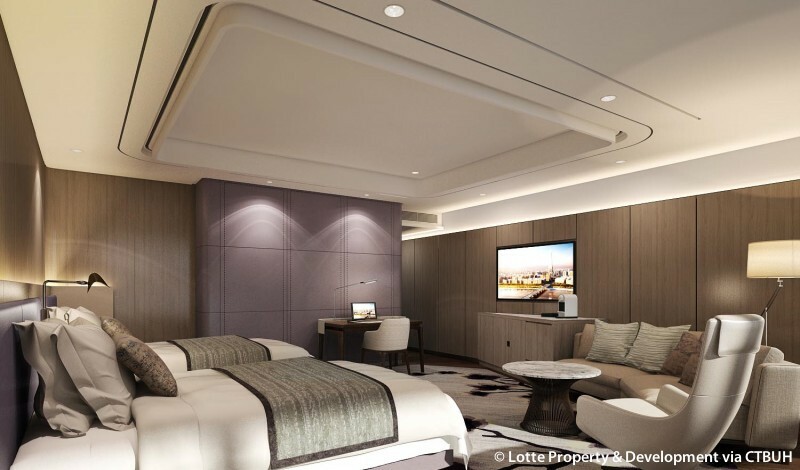 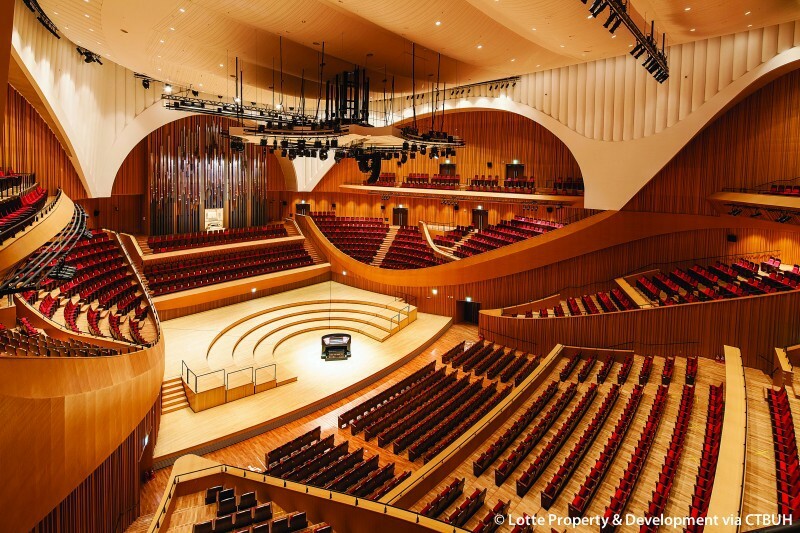 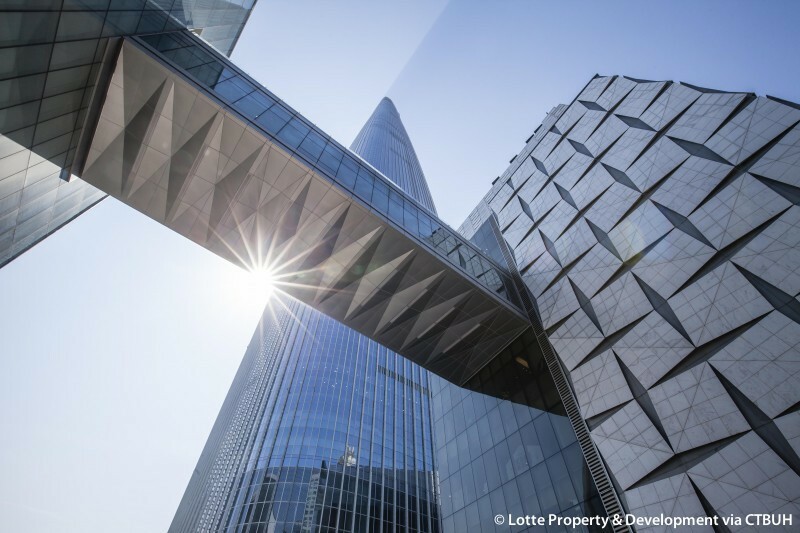 Taking inspiration from traditional Korean art forms in the design of the various interior program spaces, the sleek tapered form of Lotte World Tower will stand out from Seoul’s rocky, mountainous topography. 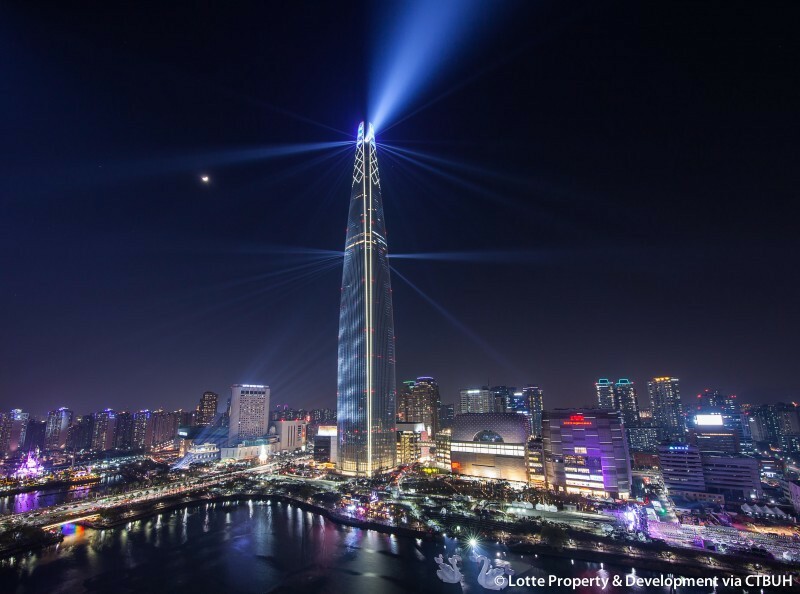 The tower is programmed with a greater variety of functions than is normally found in a tall building. 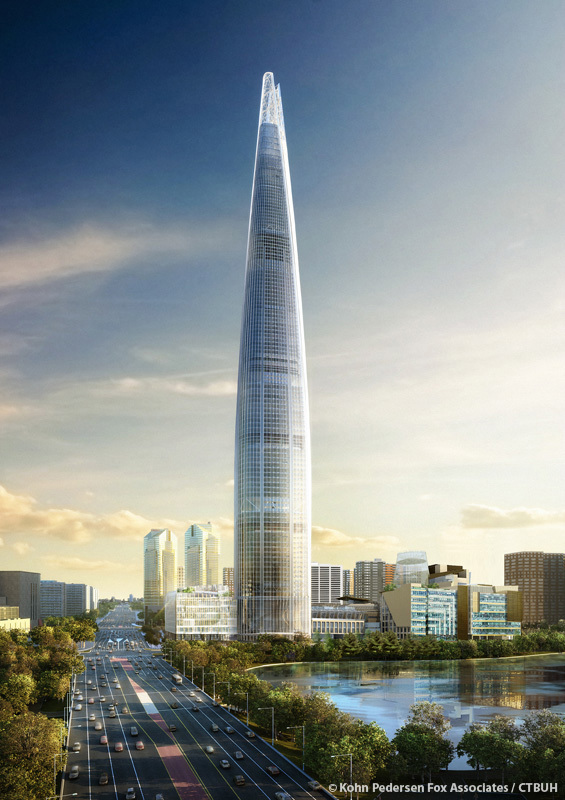 It contains retail components, offices, a 7-star luxury hotel, and an officetel. 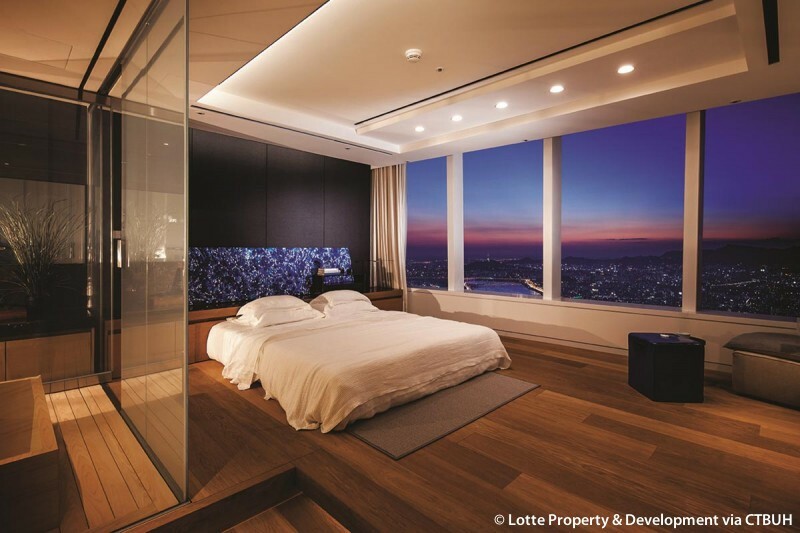 Officetels, common in South Korean real estate, offer studio-apartment-style accommodations for people who work in the building and often feature certain services found in hotels, such as furnishings, a security desk, and gym access. 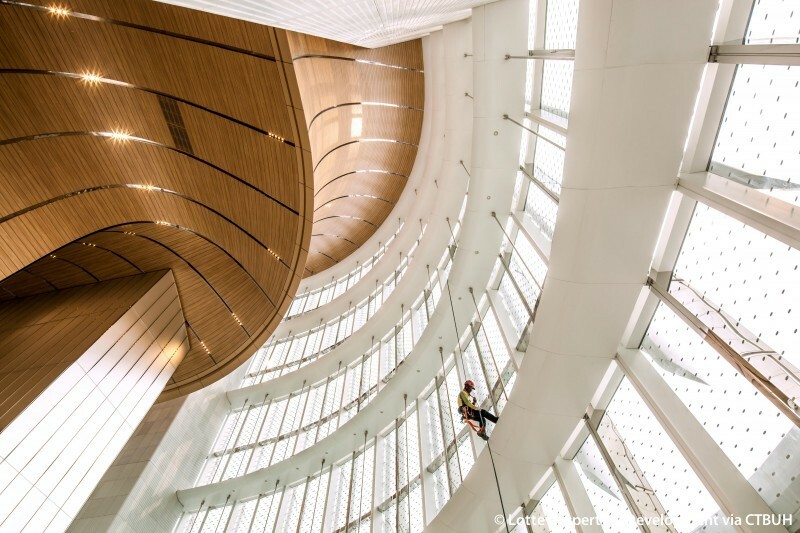 The building’s top 10 stories are earmarked for extensive public use and entertainment facilities, including an observation deck and rooftop café. 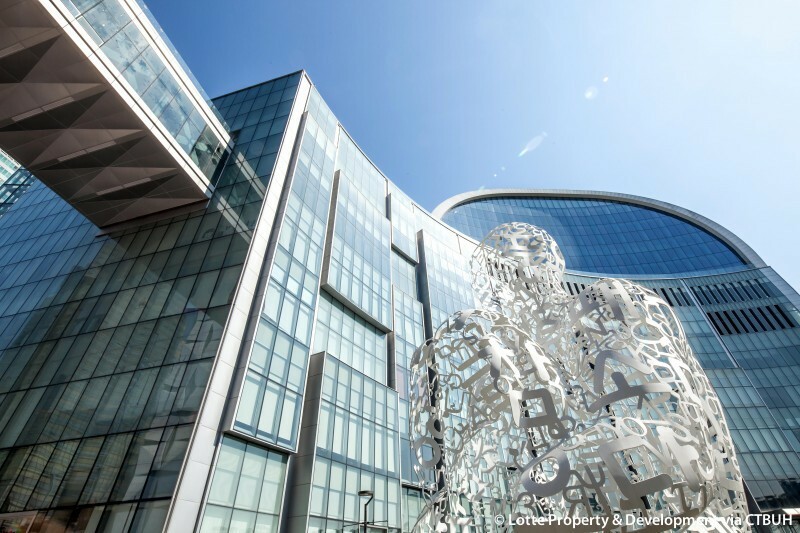 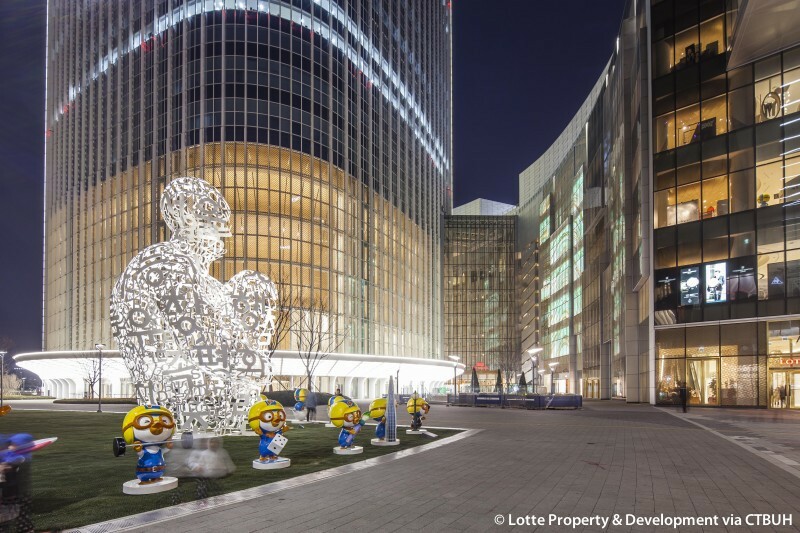 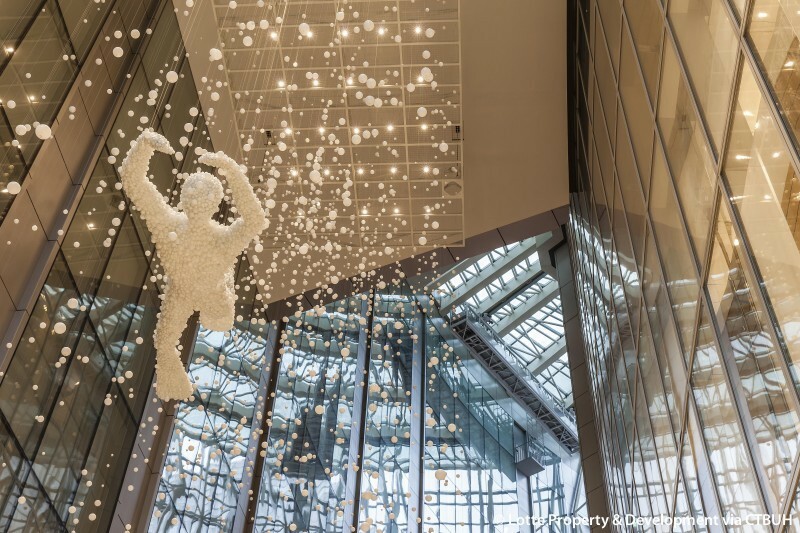 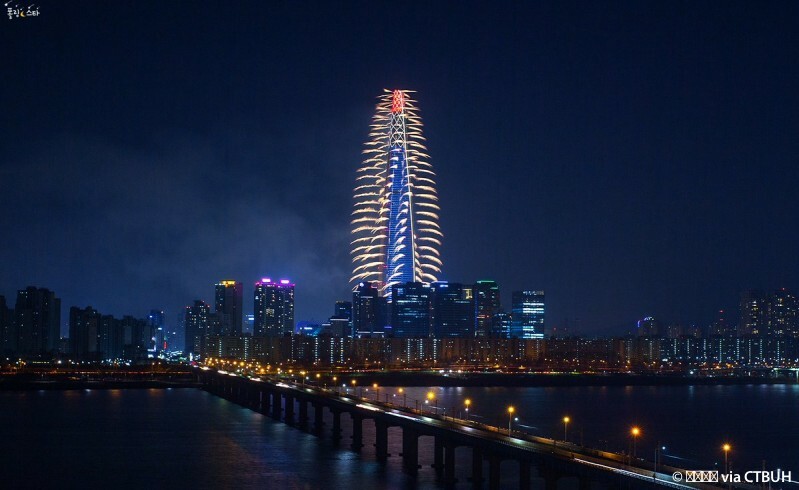 The design of the tower melds a modern aesthetic with forms inspired by Korean ceramics, porcelain, and calligraphy. 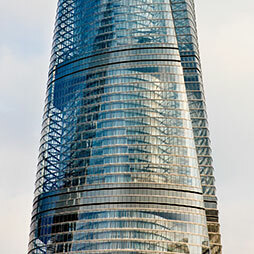 The seam that runs from top to bottom of the structure gestures toward the old center of the city. 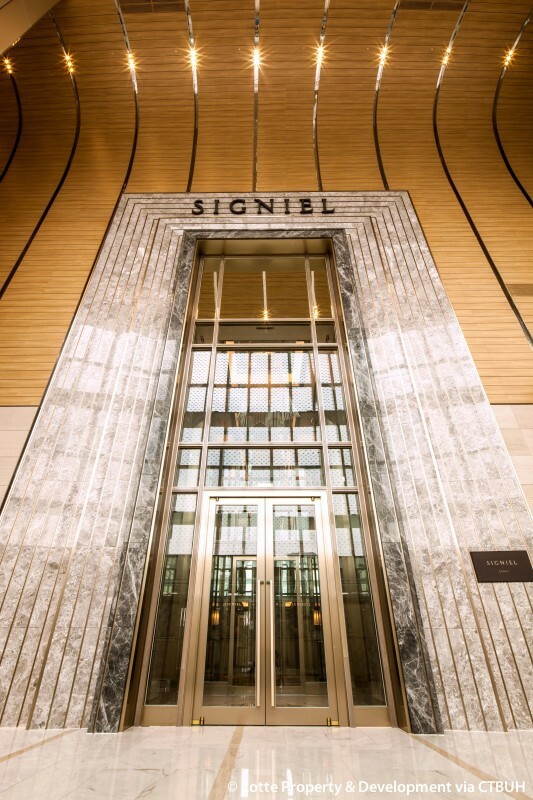 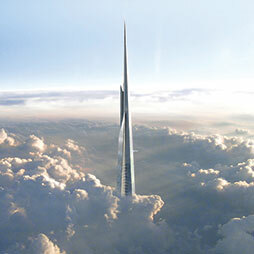 Elegance of form was one of the prime objectives, following the desire of stakeholders to bestow a beautiful monument to the capital city skyline. 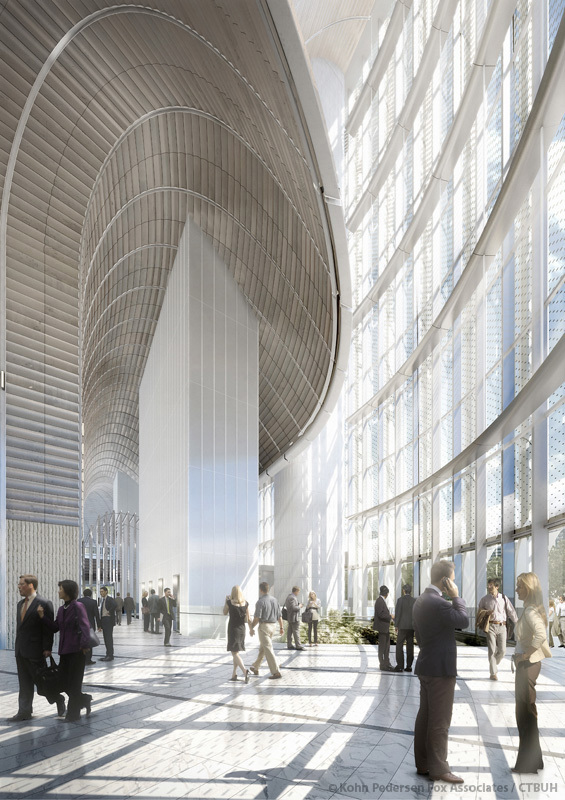 Exterior materials will be light-toned silver glass accented by a filigree of white lacquered metal. 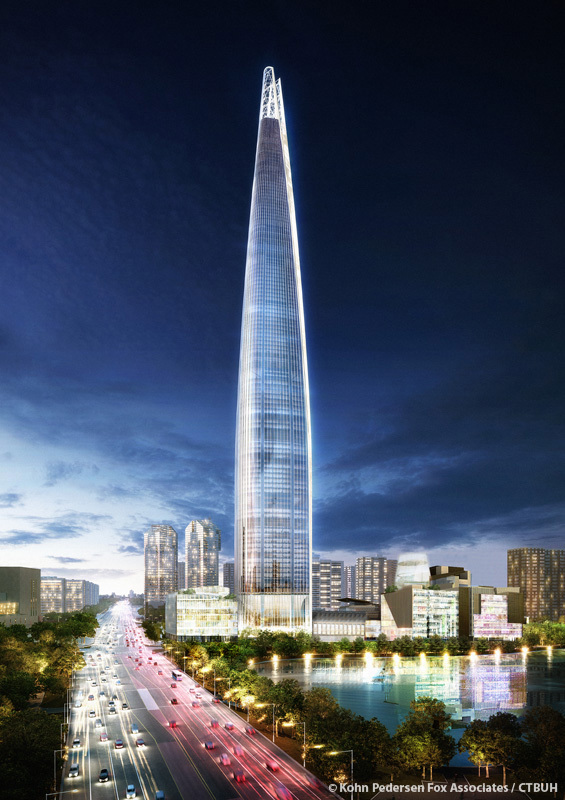 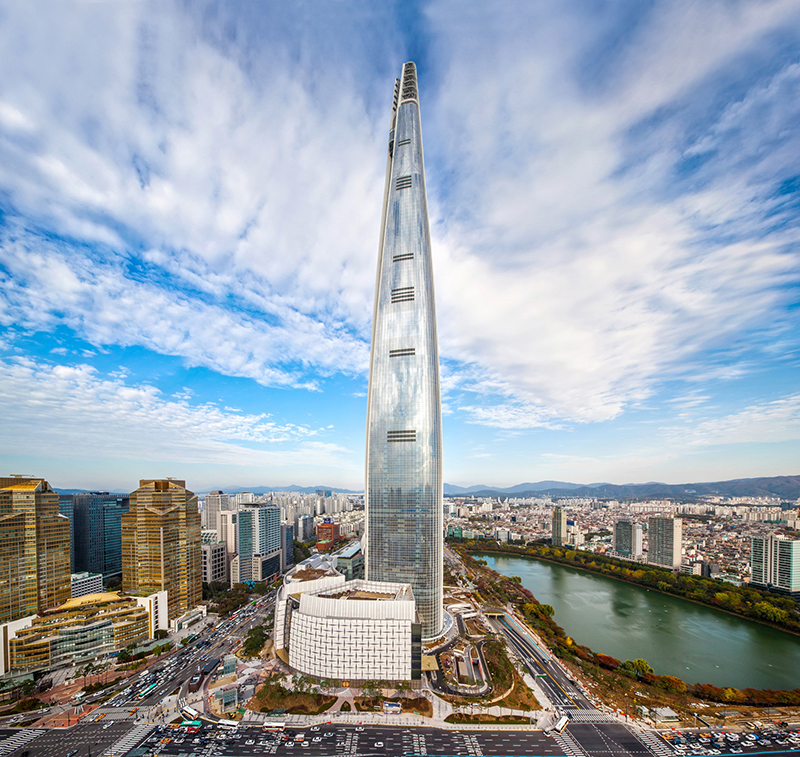 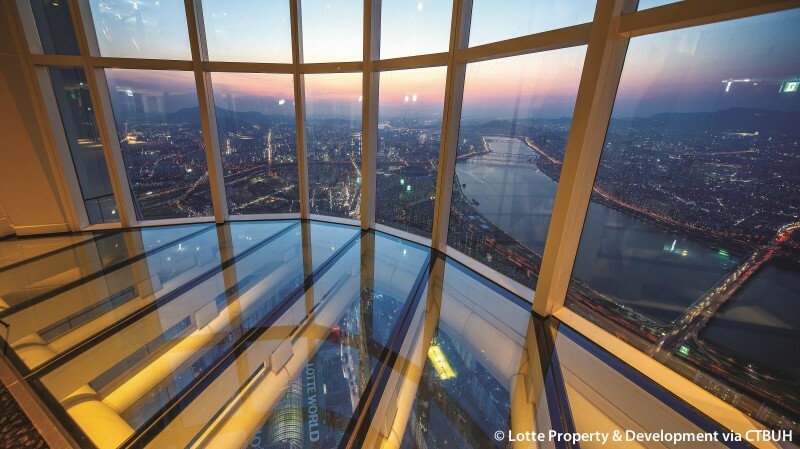 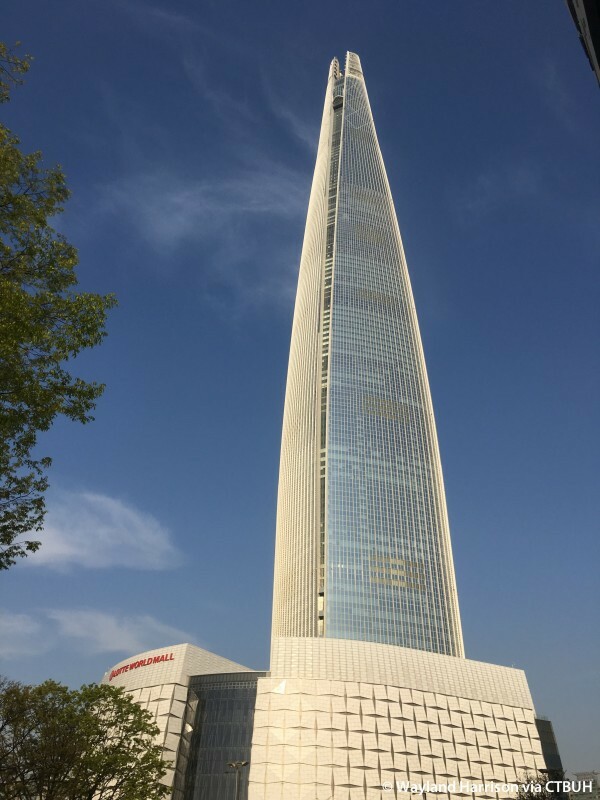 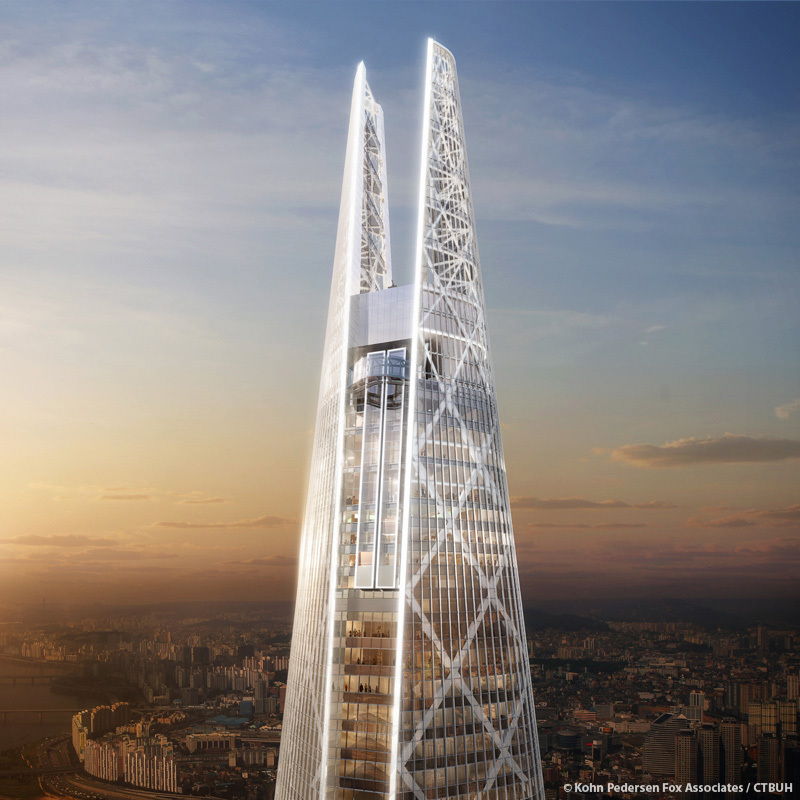 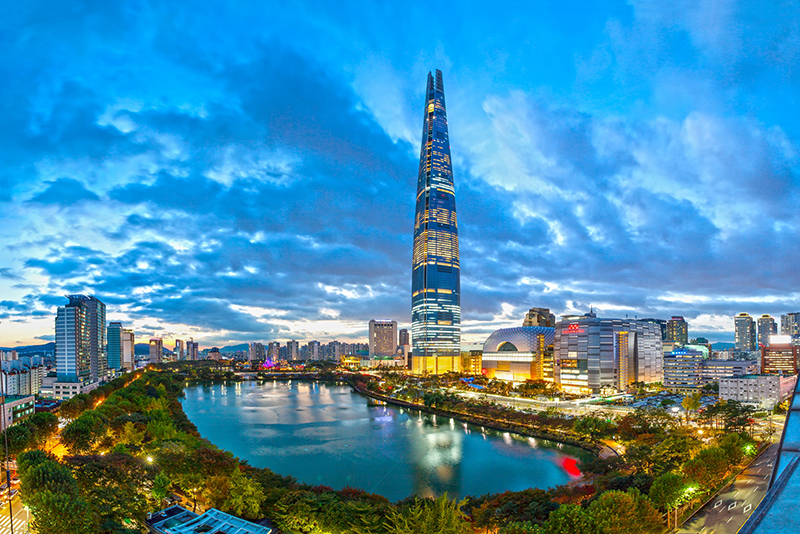 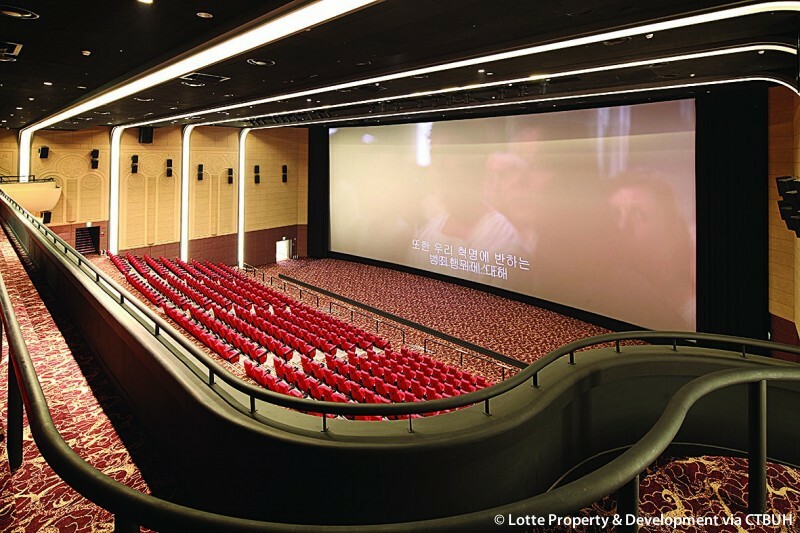 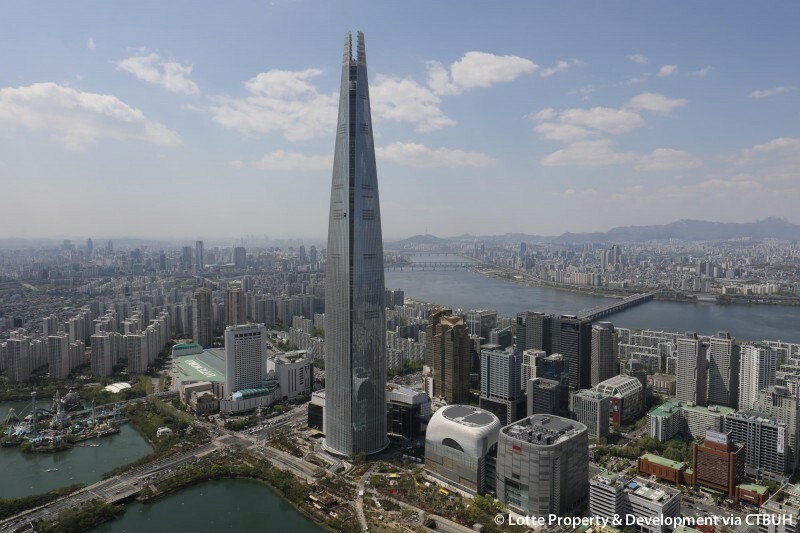 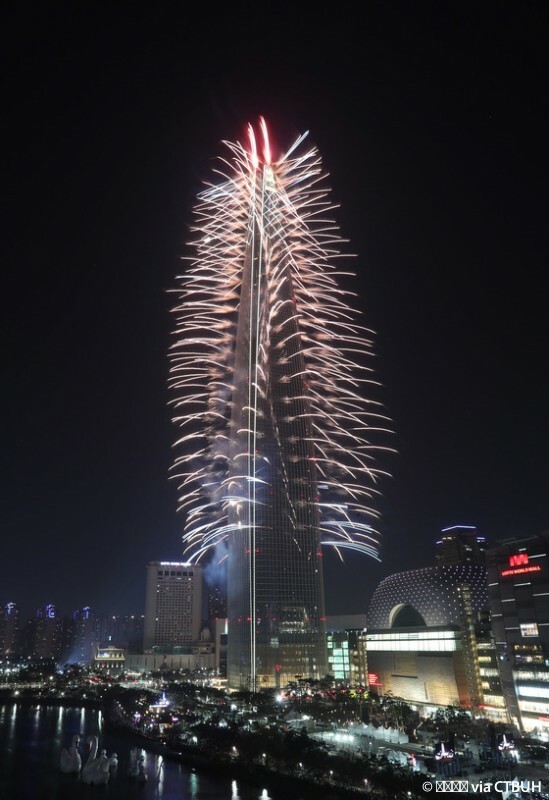 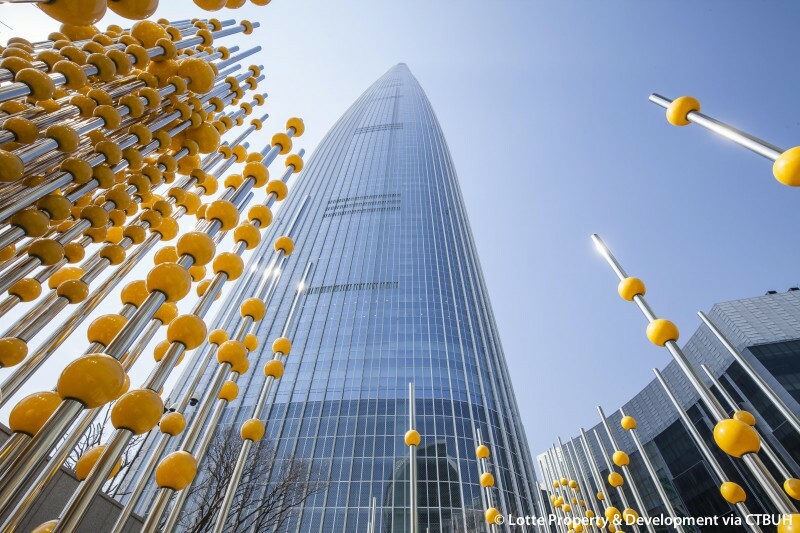 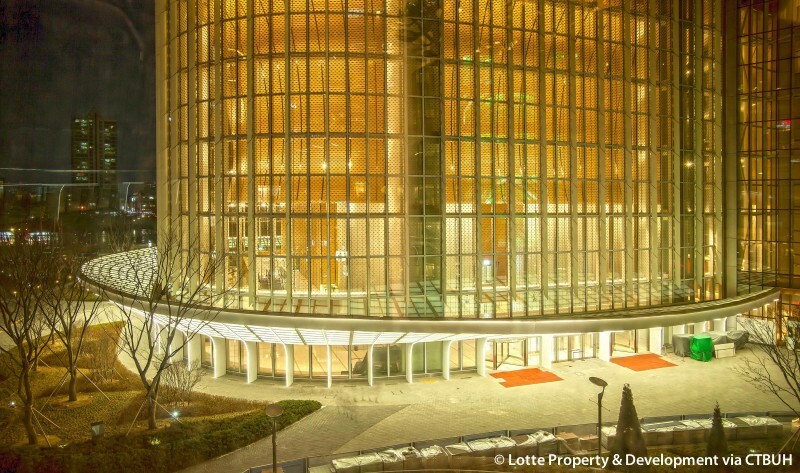 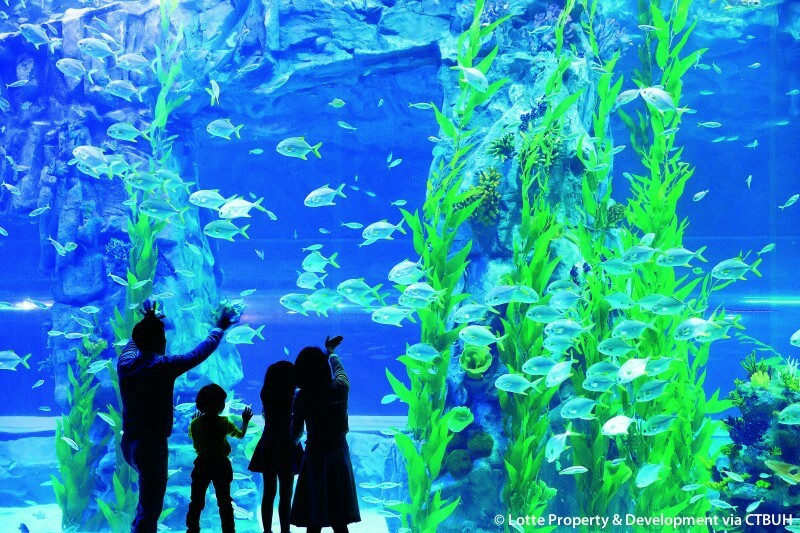 Lotte World Tower has been designed and constructed at the same time as a 10-story base that accommodates as much area as its vertical counterpart. 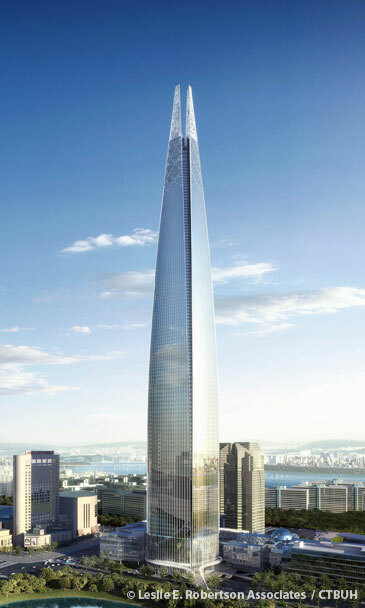 Vertical density is linked to horizontal density, and the range of complementary uses is increased. 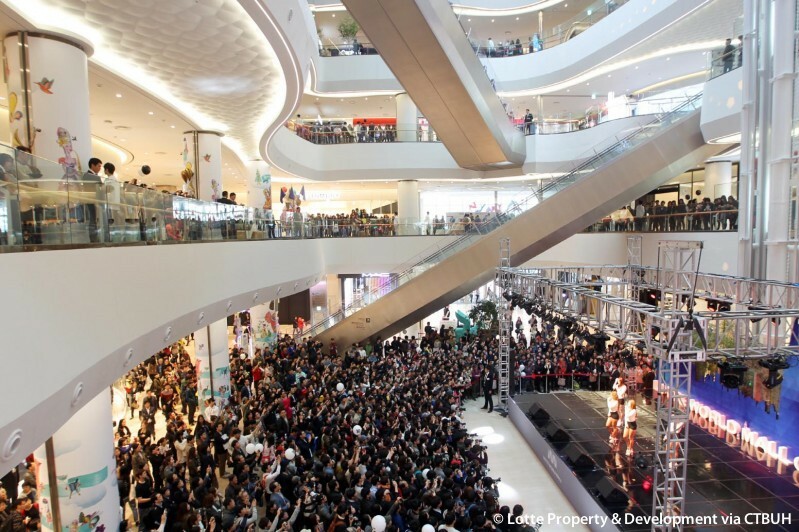 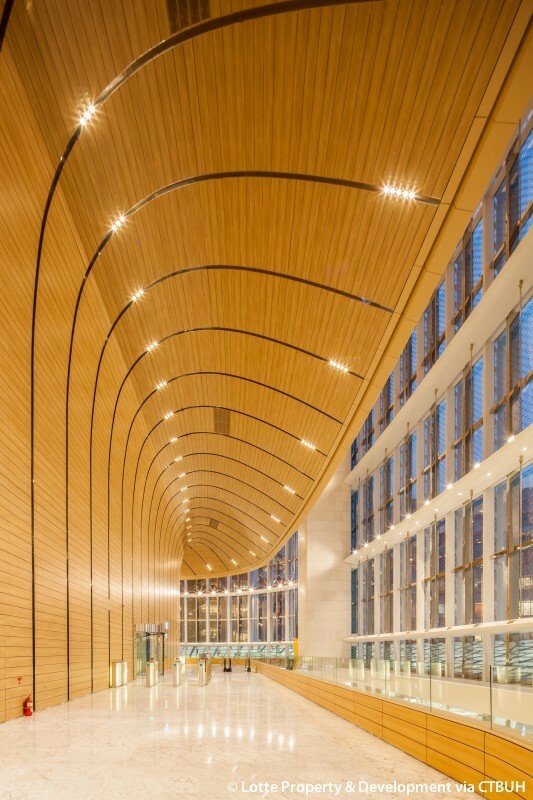 Connections between the two major building components are made via interior pathways at many levels, but also by active outdoor public space. 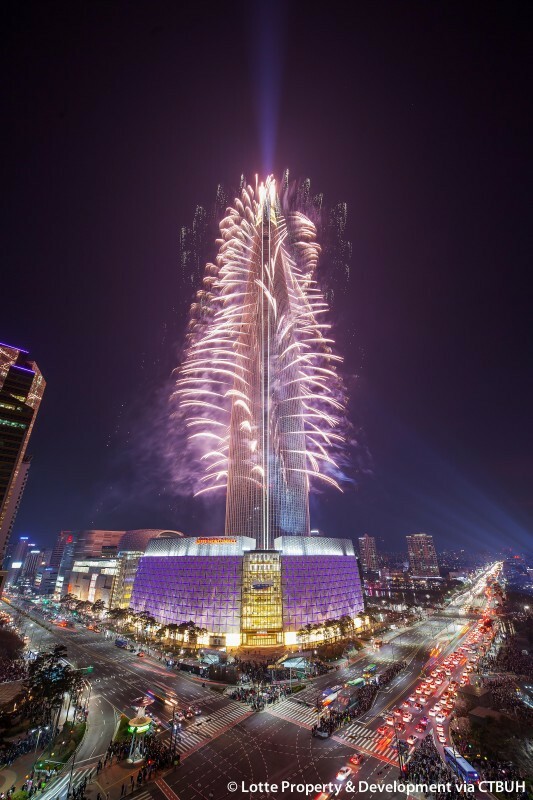 In fact, one of the most effective measures taken to activate the tower and connect it to adjacent buildings is the outdoor plaza. 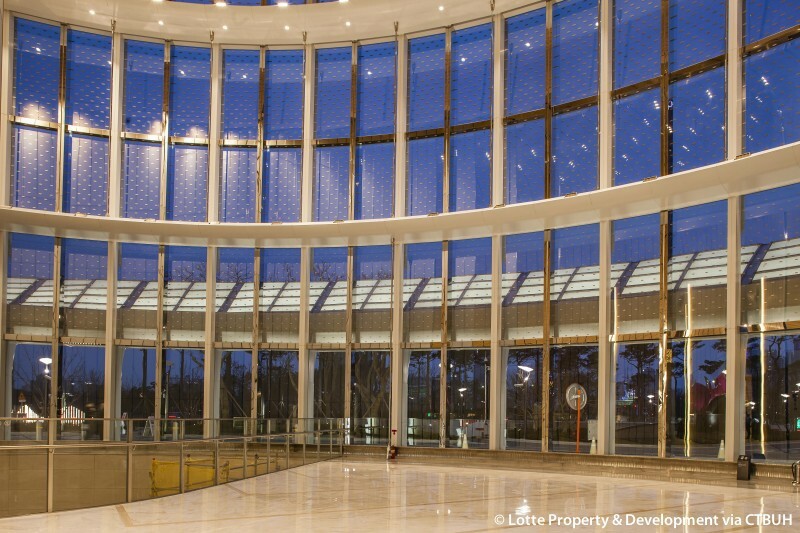 This space forms an “outdoor room,” compressed enough in its dimensions to encourage visual and pedestrian penetration of its boundary walls. 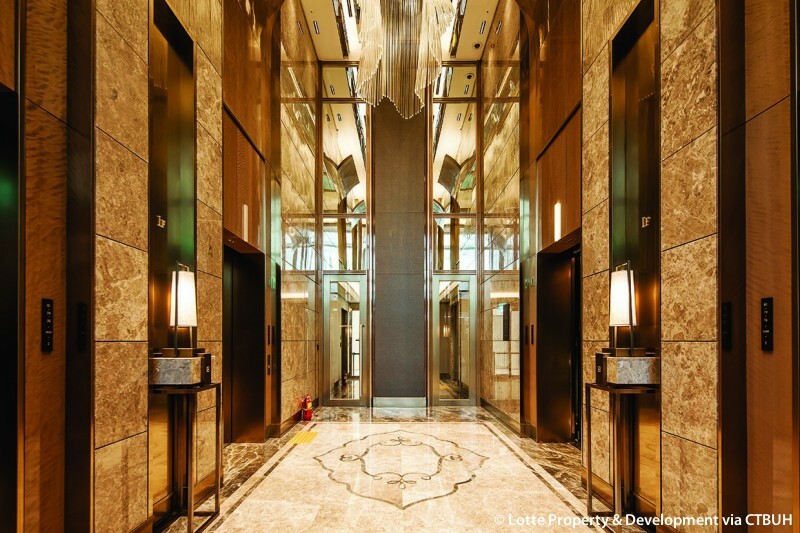 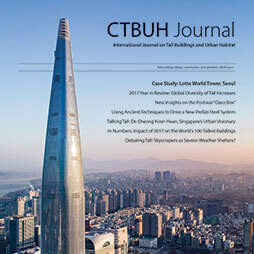 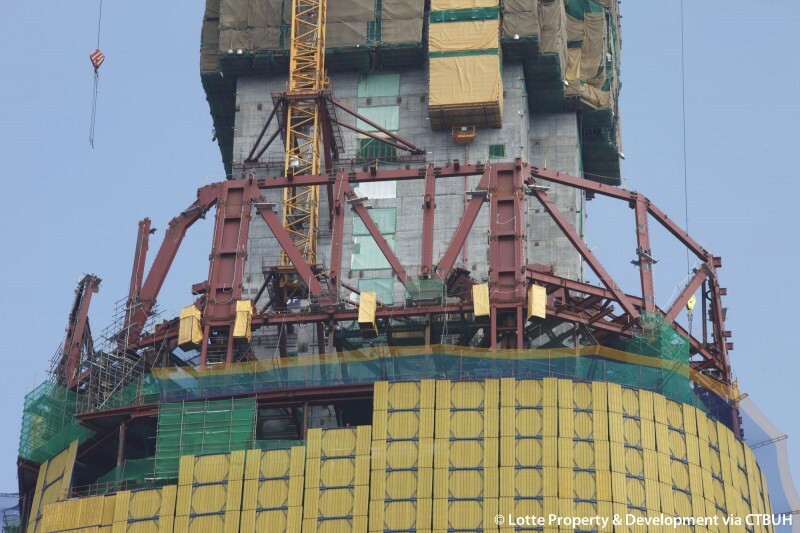 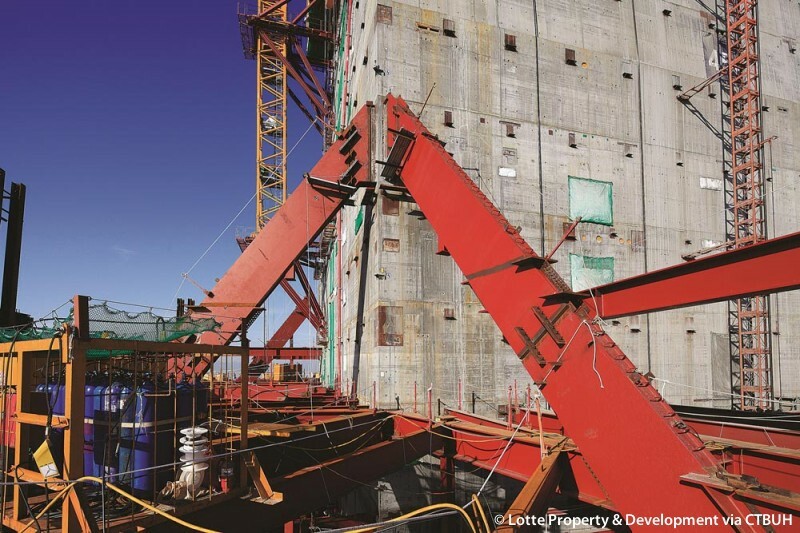 In the latest CTBUH journal, examine a case study of Lotte World Tower, Seoul's first supertall, in addition to other great features. 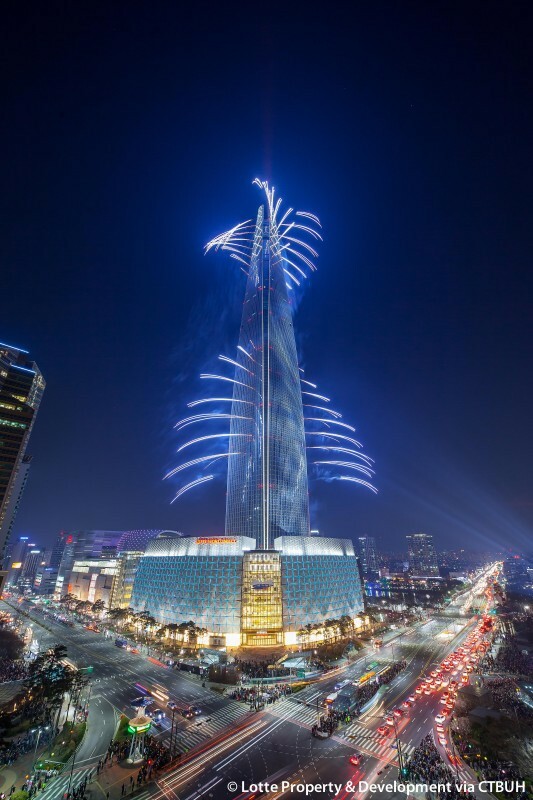 CTBUH partnered with Guinness World Records to identify the commercial building with the fastest elevator speeds and longest vertical runs. 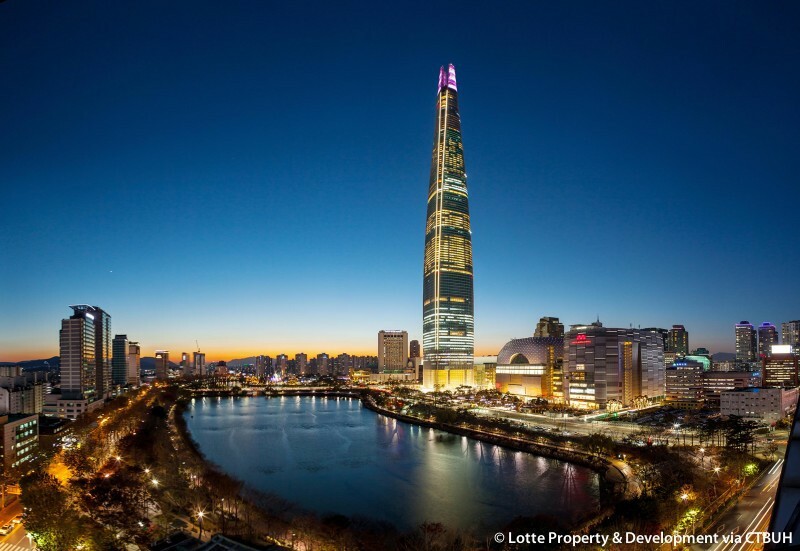 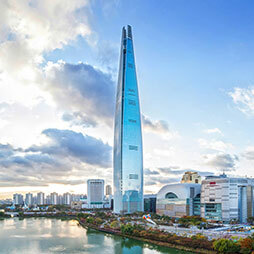 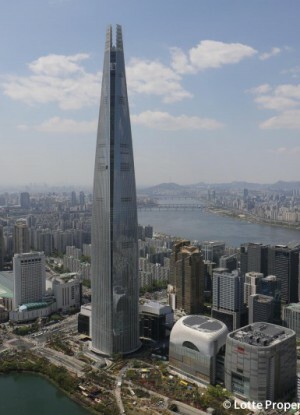 CTBUH has recognized the completion of Lotte World Tower, now the fifth tallest building worldwide at 555 meters. 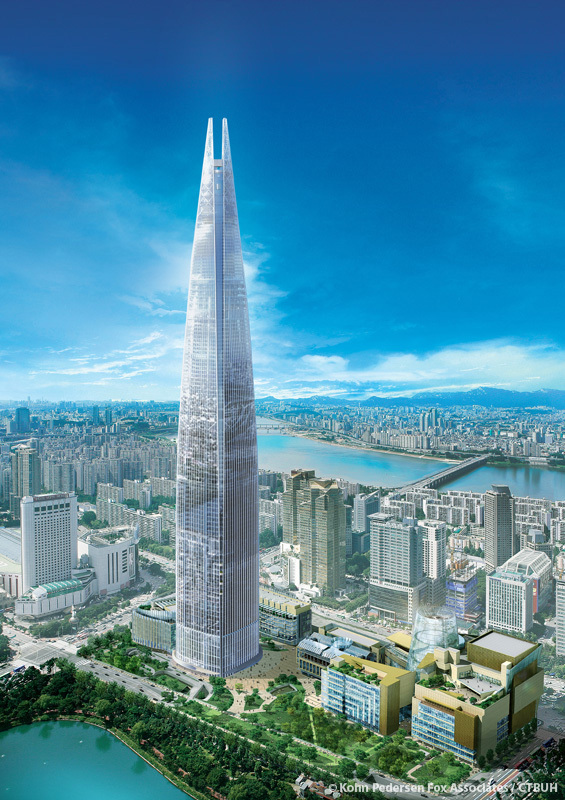 The third China-Japan-Korea Tall Building Forum was held at the Tokyo Institute of Technology, on the topic of "Innovative Motion Engineering in Tall Buildings." 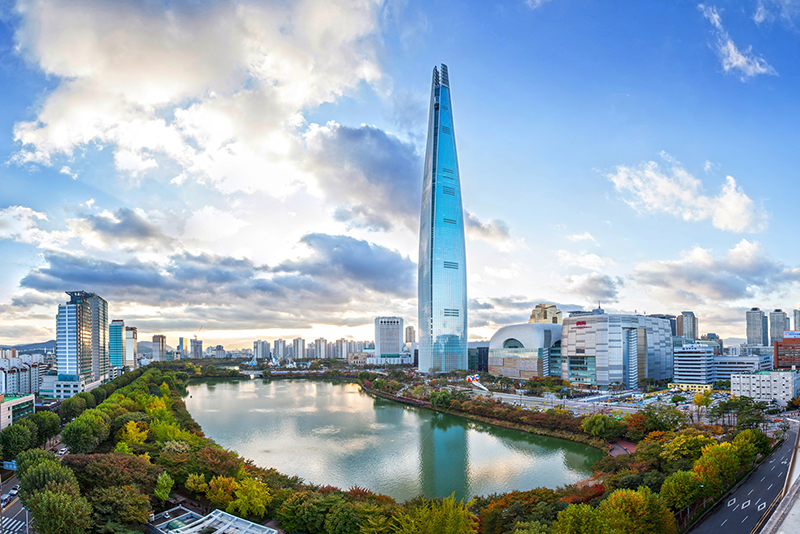 The 2015 Korea-China-Japan Tall Building Forum was held jointly between the CTBUH chapters of the three countries. 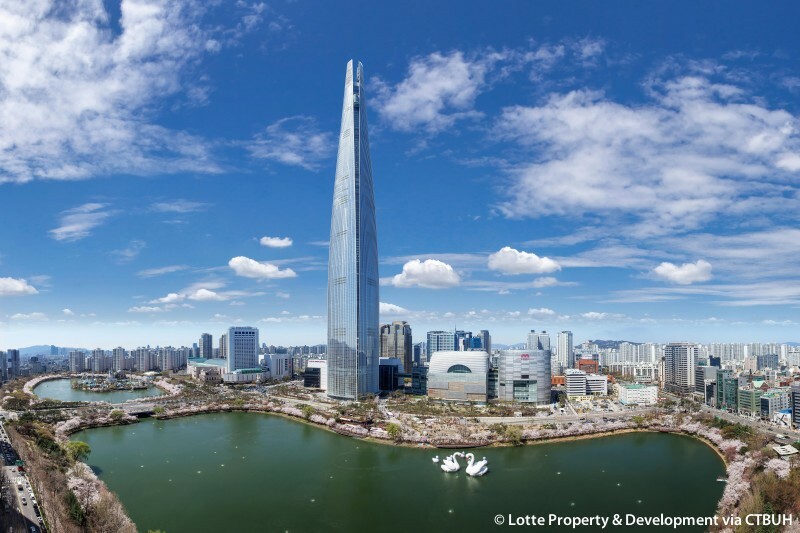 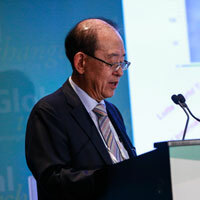 CTBUH-Korea’s President Chung KwangRyang held an international conference addressing Tall Building Safety as the construction of tall buildings is increasing exponentially. 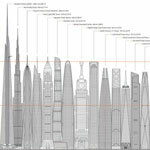 Within this decade we will likely witness not only the world’s first kilometer-tall building, but also the completion of a significant number of buildings over 600 meters. 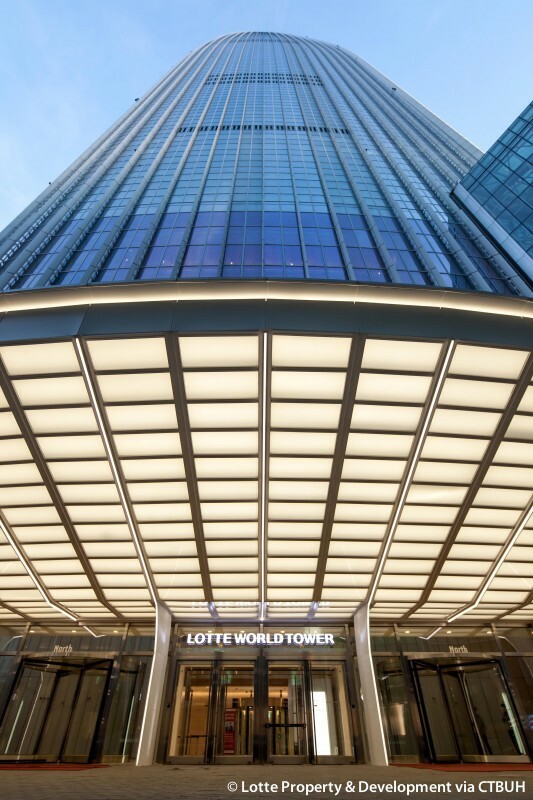 A tour was hosted at the Lotte Jamsil Super Tower construction site that was abuzz with the activity of trucks and cranes. 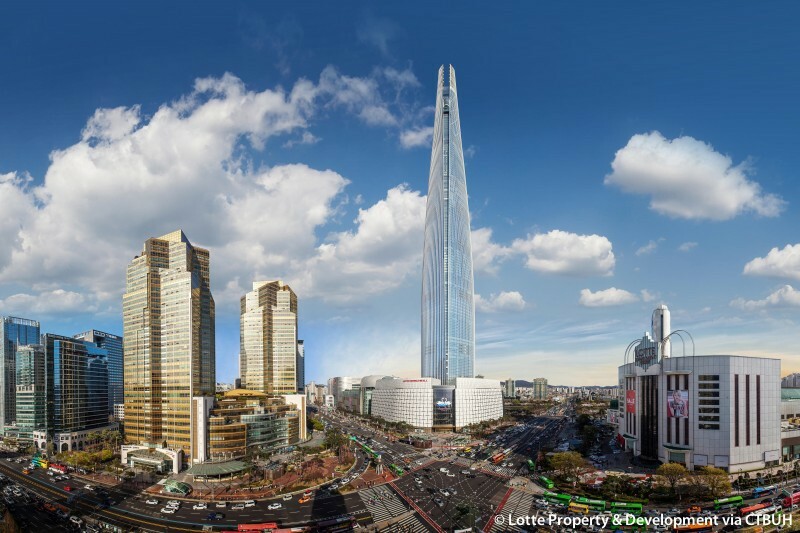 CTBUH Executive Director Antony Wood and 12 advanced architectural students from the Illinois Institute of Technology visit Seoul to work on a hypothetical tall building design project. 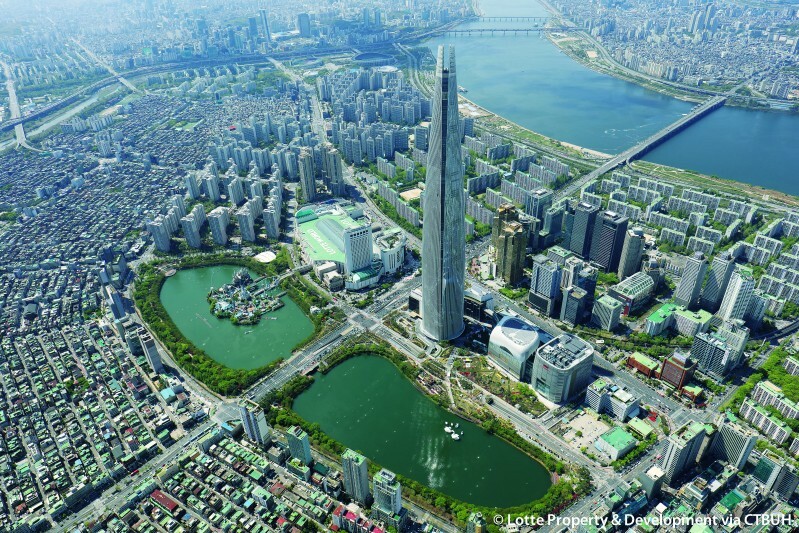 Executive Director, Antony Wood, embarked to Seoul to begin the organization of the anticipated Seoul 2011 conference and tour local tall buildings.